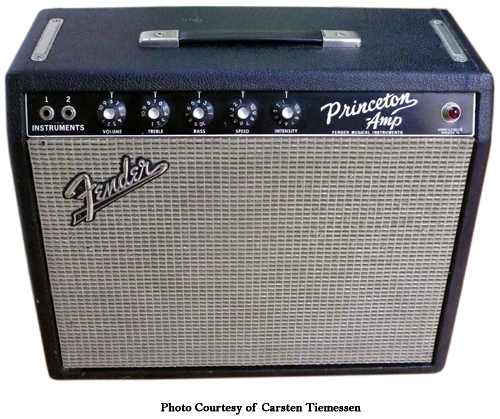 Comments: The non-reverb Princeton did not exist as an AA763 model, instead, it kept the 6G2 designation well into 1964. It was basically a Brownface Princeton with a blackface cabinet and faceplate, but the faceplate had numbers for the controls (like the brownface amps) and the knobs were the white barrel-knobs as found on the Blonde amps from around Â´61/Â´63. Thanks for this info – I have a 64 Princeton and was looking for specs. Don’t know the exact weight, and I think it’s about 12 to 15 Watts RMS. It’s a great amp but not as collectable as the Reverb. This might seem odd,but I own a 66 princeton blackface (non reverb) but can’t seem to find a manual for it. Is there anyone who can help me with one?